Your puppy needs high levels of proper protein for energy and growth. Those puppy eyes can melt your heart, so you want the best for your love bug. That means the best kibble to go along with all the hugs and kisses. 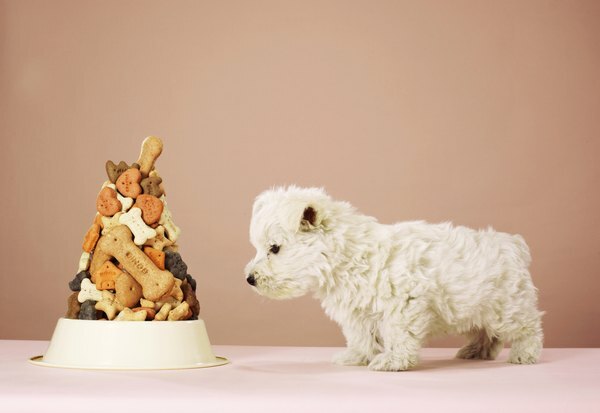 Switching puppy food in the first few months needs to be a gradual process, so your puppy doesn't get indigestion. During the first four weeks of life, mother's milk provides all the nutrition your puppy needs. At 4 weeks of age, your puppy begins the transition from mother's milk to puppy food. The process is slow, starting with a mixture of milk and just enough puppy food to produce gruel. It takes another four weeks before your pup has transitioned to eating solid puppy food. He is approximately 8 weeks old when he is ready to eat dry kibble. Most puppies are ready to leave their mother at 8 weeks of age. When you bring your puppy home, he is already eating a dry kibble and drinking water. Some breeders send you home with a sample of the food they have been feeding your pup. You may decide you want to change the food. Whether you want to upgrade to a better-quality food or you find your pup is experiencing diarrhea or vomiting, changing his food is a seven- to 10-day process. Two-month-old puppies are developing their skeletons and muscles as well as an effective immune system. Puppies grow 20 times faster than adult dogs, so they need a quality diet to aid their rapid growth. Choose a puppy food that lists meat as the first three ingredients and does not contain byproducts. Byproducts are the leftovers other than meat, such as brains, blood and bones. Once you find the kibble you want to switch to, begin the transition with increasing ratios of new food mixed with the old food. Because your puppy is eating either three or four times a day, mix a day's amount of food and then divide it into equal amounts for the scheduled feedings. For the first two to three days, mix 75 percent of the old food with 25 percent of the new food. For the next two to three days, include equal portions of both foods. For the next two to three days, mix 25 percent old food with 75 percent new food. Then your pup should be ready to continue with just the new food, without any diarrhea, vomiting or indigestion.